Proves the ECV Comms System pays for itself in 28 Days & then makes you money. We take the security, safety and productivity of our customers’ assets very seriously and combine this with 1st class customer support. We are your dynamic partner and would be pleased to visit you and bring our Kosran ROI-Return on Investment Calculator with us to confirm to you – that we will make you money after 28 days. We offer a quality engineered package, specifically designed for your operational needs: security, safety, asset management productivity and registration system. You can help yourself too – refuse to hire machines which are not secured with Kosran – locate them on our Hire Locator, click here. Call Kosran today at 0870 7875687, to find out more about the benefits and features of Kosran products. 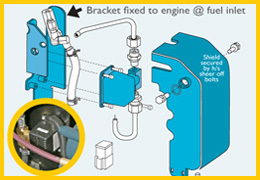 The ECV® smart-valve shuts-off the diesel fuel supply, locks the hydraulics and has an anti-start electric immobiliser. Also a secure tracking and asset management system has been integrated into the ECV. Result - ECV® Comms System. It arms automatically every time the operator switches the engine off. Safety & Authorised Users Only. By a very simple internet or sms text procedure you can remotely switch on and off the ECV diesel smart-valve and control by whom, when and where your fleet is used (every night on shared sites; no weekend freebies, damage or repairs); you can change, add or delete Keypad PIN Codes, and track globally to within 3 metres. Kosran controls plant with a text. The Keypad has an extensive code memory. Your service engineers and drivers each have a personal code to access your fleet 24/7. Transport scheduling at your convenience – Lorry, tax, driver, fuel etc., Cost £300 per day. Because you can instantly remotely shut down plant and because your driver has his own personal PIN Code to operate every machine, means full lorry-load drop-off deliveries & collections - efficient route planning ‘at your convenience’ because the asset is not being used or abused. Saving your operations one ‘truck-day’ per month of £300. This excludes savings from best use of yard, workshop personnel and just-in-time servicing economies and instant plant audits. Utilisation and Audit:The ECV Comms system will track and locate the nearest available suitable machine for the next job, not the furthest away. You are able to locate and identify every machine in your fleet 24/7. e.g. What was the value of the assets you did not locate at your last audit? 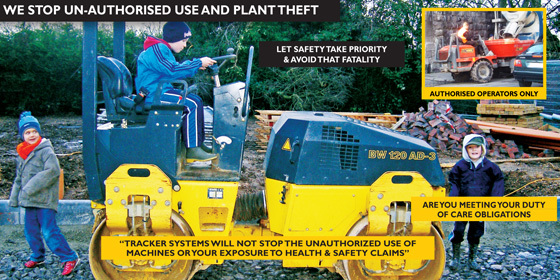 Productivity - The ECV Comms can retrieve the date, time and PIN Code identity used for the hours a machine was worked (productivity) or resolve disputed claims which require an accurate report at the time of incident or accident; including Kosran secured operated plant issues. Saving you all the admin hassle you can handle. When you shut-down Kosran secured plant … it stays shut-down. Factory line fit installation takes 16 minutes; a retro-fit installation takes 1 hour 15 minutes and it takes a well prepared skilled thief 1 hour 30 minutes to bypass. It is much easier to steal someone else’s machine. Livery: Consider scaling back investment on Livery and spend it on Kosran. Is Kosran a better investment than ‘dead money’ spent on an annual insurance premium? We have no comparative competitor, for example the anti-start electric immobiliser provided by OEM Manufacturers JCB, Kubota and Manitou are not comparable with the Kosran ECV® diesel smart- valve immobilisation and integrated tracking & asset management system. Price. Kosran is not a cost it’s a benefit. Outlay: The Price of a Bucket. Payback: 28 days.